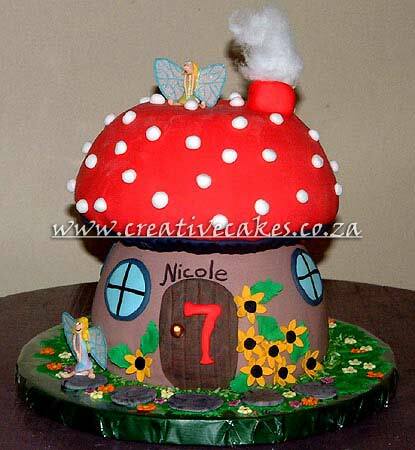 A Mushroom Fairy Cake is a super cake for a little girl or boy of all ages! Learn to make one of these cakes! The above cake is found with step-by-step instructions in our Cake Decorating Book! So you can learn how to make it yourself from home! This is a truly original cake that I have enjoyed creating ever since I started Creative Cakes. This cake always comes out different but each is as beautiful the others. Colours, characters, ideas, patterns can all be customised to suit your child's favorites. There is no end to the options. All Fairy Tales can be captured in my 3D Cakes.